Who says a small printer can’t play the role of a robust multifunction office machine? We at Pacific Office Automation are proud to offer the Muratec MFX-2550, a revolutionary document management solution for the mid-size office environment. This inventive system provides you with useful features such as single pass duplex color scanning, direct USB printing, shift-sort document output, embedded document indexing, and more—all of which can be controlled by a touch screen interface that will help all operators use this machine correctly and efficiently. Operators can scan color documents--collected at resolutions up to 600 x 600 DPI (dots per inch)—while also keeping images, graphics, and text crisp. The detail-oriented Muratec MFX-2550 also allows users to quickly move through large-volume scanning projects at an astounding 62 ppm (pages per minute). On top of this, DirectScan functions allow users to scan documents directly into PC folders without having to install pesky additional computer software. When you’re ready to distribute information, documents can be sent to any of the 2,000 email addresses that can be stored within the hard drive on the MFX-2550. For increased connectivity and flexibility, users can scan to a USB device and quickly make any information conveniently portable. With printing, this model impresses even further. Single-sided documents output at a speed of 25 ppm (pages per minute) and 7 ppm if you decide on 2-sided printing. A 50 sheet multipurpose bypass tray allows users to print many forms of media including envelopes, stationary, labels, and transparencies. 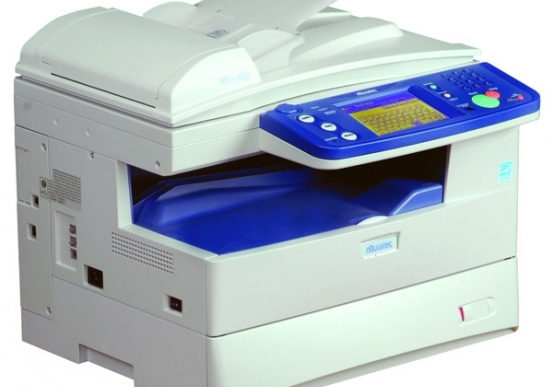 As a fax, the Muratec MFX-2550 provides your office with a whole compilation of unique facilities that allow you to speed up communication and distribute documents simply and smoothly. If you invest in the MFX-2550, you will only see a return on your purchase—day after day.